La Mirada, CA – Makita has created the world’s first 4-stroke engine power cutter, the 14” MM4™ 4-Stroke Power Cutter (model EK7651H). 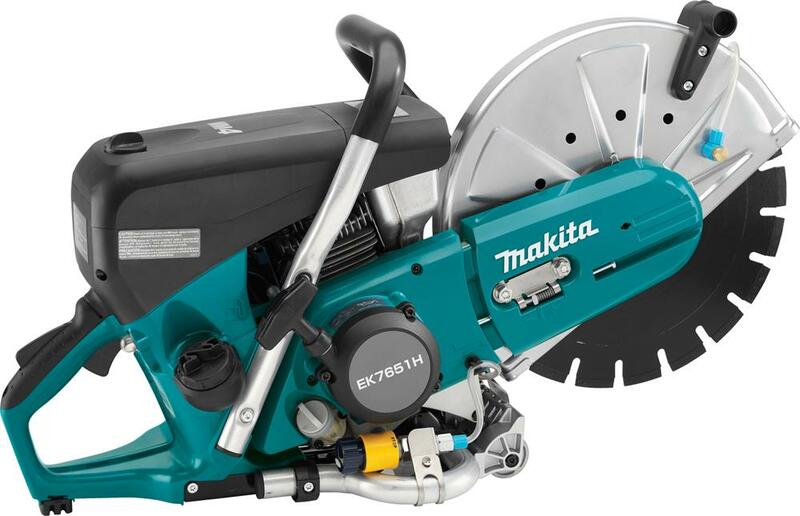 The EK7651H is the latest innovation in Makita’s extensive range of concrete solutions. Makita applied years of research into the development of the EK7651H power cutter to solve the most common user pains including fuel mixing, but also start-up’s, fuel economy, ease-of-use during long cuts, and more. The EK7651H has a 4.6 cu.in. (75.6 cc) engine with 4.1 HP (maximum horsepower) and a no load speed of 9,350 RPM to take on the most demanding applications. The automatic engine decompression valve is engineered into the cam gear to reduce pull start force by 40% for easier starts. In addition, the pressure-compensating carburetor with vented choke plate is engineered to reduce flooding by automatically adjusting to deliver the proper amount of fuel. For increased ease-of-use and maintenance, the EK7651H has a five-stage foam-paper-nylon filtration system with Advance Direction Air Flow to provide cleaner air to the engine for improved engine durability. The power and performance features of the EK7651H make it a best-in-class 14” power cutter for a range of professional concrete cutting applications and is ideal for landscapers, road construction crews, railroad crews, rescue crews, general steel contractors, masons, and welders. Makita is a worldwide manufacturer of industrial quality power tools and offers a wide range of industrial accessories. Makita utilizes leading-edge technology and innovation to engineer tools that are more compact with less weight yet deliver industrial strength power and results. Makita’s extensive line of cordless lithium-ion tools includes 18V LXT® Lithium-Ion, 18V Compact Lithium-Ion®, and 12V max Lithium-Ion. Other best-in-class products include rotary and demolition hammers and saws equipped with Anti-Vibration Technology (AVT®), MM4™ 4-Cycle outdoor power equipment, Super Joint System (SJS) grinders, miter saws engineered with Deep and Exact Cutting Technology (DXT™), and more. Makita U.S.A., Inc. is located in La Mirada, California, and operates an extensive distribution network located throughout the U.S. For more information, please call 800/4-MAKITA (800/462-5482) or visit the website at makitatools.com. Follow Makita at facebook.com/makitatoolspage and twitter.com/makitatools. Trademarks: Makita®, LXT®, AVT® and the Makita logo, Teal color and Black & White color combination are the registered trademarks of Makita. Makita is Best in Class Engineering. The EK7651H is engineered for a full range of cutting applications including concrete (top), rebar (above), and metal decking (below).